Inspires imagination and musical curiosity! Kindermusik offers your preschooler the best of everything. We’ve got social, emotional, early language, and motor skill development covered, plus your child gets the added beneﬁt of music permeating everything we do to get those neurons ﬁring! Have you noticed your child’s explosion in vocabulary, storytelling, and imagination? We know that preschoolers thrive on pretend play so Kindermusik classes include songs, stories, and instrument ensembles to nurture your child’s budding creativity. Bonus: it’s fun!With cognitive, emotional, and social beneﬁts, a Kindermusik class is the perfect place for your preschooler. Preschoolers are actively expanding their base of knowledge through trial and error, talking, moving, and yes, even being a little silly at times! There’s no limit as to how far a little imagination, a lot of music, the joy of being with friends, and some Sharing Time with family can take these eager learners who are also on their way to becoming promising musicians in their own right. Language Development – The preschooler has a lot to say, and he loves to tell stories and share information. Kindermusik gives your preschooler an outlet for self-expression by capitalizing on his capacity for imaginary play, his ability to follow 3-step directions, and his interest in making up stories and rhymes. Vocal Development – Now that the speaking voice is more fully developed, we’ll turn our attention to finding the song that’s in every heart. The singing we do in class will expand the children’s song repertoire, help them begin to match pitch, and teach them to use their voices expressively. Cognitive Development – These concrete thinkers are also curious learners who have an increasing ability to think about ideas and things that are not immediately visible. Our Kindermusik activities give lots of opportunities for stretching those cognitive abilities through labeling, repetition, sequencing, and participating in pretend play. Gross Motor Skills – Skills like hopping, skipping, running, and walking are refined as we add the challenge of moving to a musical cue. Kindermusik helps your active preschooler become more expressive in his movement, giving her lots of opportunities to benefit from the strong connection between moving and learning. Fine Motor Skills – Drawing simple objects on paper or building a tower with blocks show that your child is ready to take on the challenge of using a mallet and playing instruments with greater variety and skill. Kindermusik provides a critical bridge of musical learning and experience. 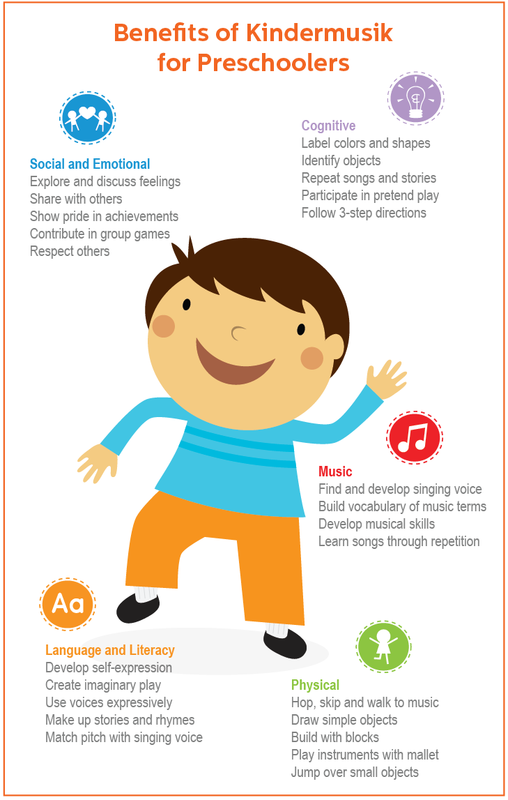 Social Emotional Development – Every child is a contributor in our Kindermusik classes! Respect for each child and a knowledge of age-appropriate expectations means that your child’s teacher provides a secure environment for each child to explore, learn, grow, and contribute. Musical Development – Kindermusik taps into your child’s natural musicianship and developing musical skills. We’ll help your child find and develop his singing voice and teach him a beginning vocabulary of music terms.